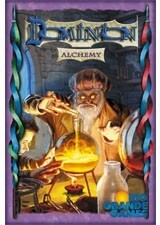 This expansion of Dominion is the first to add a new type of currency, the potion. Some of the new cards have potions in their cost, and some give special bonuses for using potions. This sets up some interesting new card combinations and add a new layer of strategy in the game. If you love Dominion, give it a play. Enjoy! This expansion includes a new type of currency: potions. The game has several action cards that are purchased with potions and give you special bonuses for using potions. It can set up some pretty interesting combinations. If you love Dominion like we do, give this expansion a try. Enjoy! The addition of potions as a treasure cards make this game very interesting. My favorite attack card, the Familiar, is in this set. I also love the university which gives you a free card and actions. The box is smaller but there are some really great cards to add to the mix.